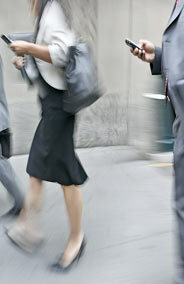 Your reader is on the move – often rushed, preoccupied, agitated, distracted, and possibly frantic. Your email message is being read on a screen the size of a playing card – among everything else and in the clutter. You only have 25 visible characters for your headline. Your reader has the reputation of having the attention span of a fly. There is no room for miscommunication, no time for the inevitable to-ing and fro-ing of clarification emails. Your reputation – and a lot of money – is on the line! Even if you’re unaware of it, there is an increasing chance that the email you have just finished writing will be read on a mobile device (iPhone, BlackBerry or the like). According to the Face of the Web Annual Study, mobile devices could soon rival the PC as the world’s dominant internet platform. Leaving out specific details to keep the message brief and abbreviating sentences because the reader “will know what you mean” increases the chance of miscommunication leading to costly mistakes and frustration. If you find you are to-ing and fro-ing with questions and answers, this is a sure sign that your original message was incomplete and unclear. It is a good idea to divide and conquer by ensuring each message has one clear purpose. Remember, your reader will only be scanning your message, so avoid loading the message with many ideas. Anything longer than three short paragraphs should be sent as an attachment or a link. With statistics showing an ever increasing use of mobile devices to retrieve email, gone are the days when it’s acceptable to send a report, quotation or proposal in an email. The email should be used as a tool to convince the reader to read further. In your email, include only the purpose of the message, why the attachment is important for the reader (what’s in it for him/her) and a clear call to action (if there is one – and there usually is with email messages). Write a short and meaningful subject heading that reflects the message’s purpose. Keep the subject heading to approximately 25 characters. Business email messages should not be written as you would write an SMS. Don’t remove the niceties (words like please, and greetings and complimentary closes) and don’t use abbreviated sentences in your quest to keep your message brief. People don’t like it when they receive what they feel is a cryptic message or when they believe you’re being disrespectful or rude. Streamline long, awkward sentences and remove repetition and unnecessary wordiness. This is where you can make the biggest impact on the length of the message. For stand alone lists, use horizontal formatting rather than the usual vertical alignment. This saves space and reduces the amount of scrolling needed. There are two main ways to ensure a good white space ratio. Removing line spacing and using long paragraphs does not make the message shorter – it only makes it difficult to read and scan. Avoid using formatting in email to ensure the way the message appears on your reader’s screen is the same as how you sent it. Anything that needs formatting should be sent as an attachment. 10. EDIT AND PROOFREAD – PREFERABLY MORE THAN ONCE! Ensure your message is professional by checking it carefully for spelling, typing, punctuation, case, grammar and sentence construction errors. If you don’t have time to proofread the message, no matter how short it is, don’t write it in the first place – make a phone call instead. So from now on, write all your email messages as though you’re writing for a mobile reader and save all your readers time and effort. Avoid email hell and cut your recipient’s reading time by 50% by following 10 guidelines that will have you writing like a pro. Be especially careful when using Update. The word implies there is no action required, so if you do need some form of action, select a different option, for example Request or Action item.